Ever sit down to start a project, finish it and think to yourself...whoa that took on a completely different direction!? 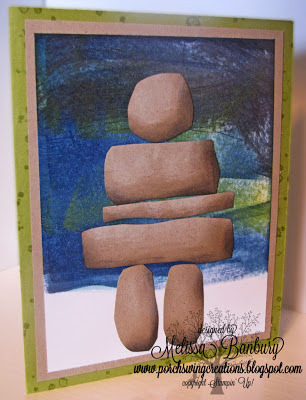 That was this card - I had no intention of creating punch art nor an Inukshuk for that matter...it just kinda happened. Sometimes it works to pre-plan and the next time to just let your hands do the thinking! This sample uses a method called Direct to Paper to create the background. If you'd like to see some other samples using this technique, click HERE. Begin with a piece of Whisper White cardstock 4" x 5". In portrait position and using the direct to paper method, smear Baja Breeze ink across the top 1/3 of the cardstock. Next, apply Lucky Limenade, then Midnight Muse, using the same method. At the very top of the cardstock, smear a small amount of Basic Gray ink. Cut 2 small ovals and 1- 1 1/4" circle from Sahara Sand cardstock. Trim the edges of each piece with snips to make them appear more the shape of a rock. Freehand cut 3 rectangular pieces also from Sahara Sand. Sponge the edges of each piece with Crumb Cake then Basic Grey to create shadows and depth in the rocks. Finally highlight each piece by sponging a small amount of White Staz-On ink. 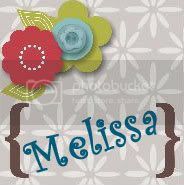 Assemble the pieces onto the background with Tombow adhesive. Just a quick note before I sign off - today is the first day of U Stamp With Dawn & Friends, Grow Creative Love! I've already had a sneak peek at a few of the projects and they are AMAZING! I've created 4 projects for this event and will be sharing each of them (along with a few other favorites from the site) over the next few weeks. If your interested in joining and receiving over 40+ projects tutorials at your fingertips, click on the Blinkie on the left sidebar to be re-directed to the site to sign up! Amazing card! I absolutely LOVE your Inukshuk sculpture. It is a true homage to the craft. The DIY background is gorgeous and I especially like the layered colors at the top!